Please Don’t Soak the Mushrooms! Mushrooms are nothing but sponges, which will soak up water easily. 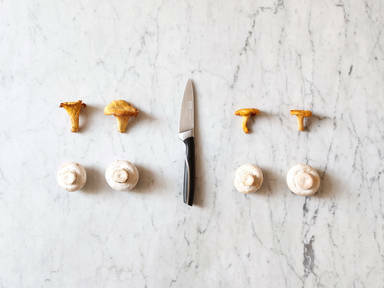 Washing your mushrooms in water means risking swollen, tasteless bits in your dish. In order to maintain the delicious taste, it’s best to clean the mushrooms with a wet paper towel instead. This way, the taste remains intense, and the structure, firm. For the real pros, there are small brushes for cleaning mushrooms. If the stem is dry or slightly stained, you can cut off a small slice of it. In general the stem is edible, however. You can consume the mushrooms as soon as they are cleaned—cultivated species, such as champignons, shiitake, or oyster mushrooms can be consumed raw, whereas wild species, such as chanterelles should always be cooked; they may cause digestion problems. By the way: Contrary to popular belief, it is absolutely fine to reheat mushrooms and consume them the next day!